A solar wind stream flowing from the indicated coronal hole should reach Earth on Aug. 7th or 8th. Credit: SDO/AIA. STRONG SOLAR ACTIVITY: For the third day in a row, active sunspot 1261 has unleashed a significant M-class solar flare. The latest blast at 0357 UT on August 4th registered M9.3 on the Richter Scale of Flares, almost crossing the threshold into X-territory (X-flares are the most powerful kind). The number of energetic protons around Earth has jumped nearly 100-fold as a result of this event. Note: The many speckles in this movie are caused by energetic solar protons hitting the camera. Moving at an estimated speed of 1950 km/s, this CME is expected to sweep up two earlier CMEs already en route. Analysts at the GSFC Space Weather Lab say the combined cloud should reach Earth on August 5th at 13:55 UT plus or minus 7 hours: "The impact on Earth is likely to be major. The estimated maximum geomagnetic activity index level Kp is 7 (Kp ranges from 0 - 9). 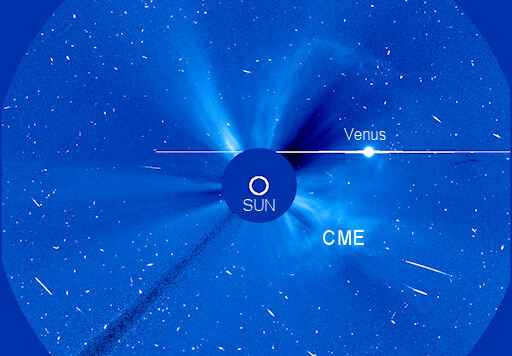 The flanks of the CME may also impact STEREO A, Mars and Mercury/MESSENGER." High-latitude sky watchers should be alert for auroras. Aurora alerts: text, voice. 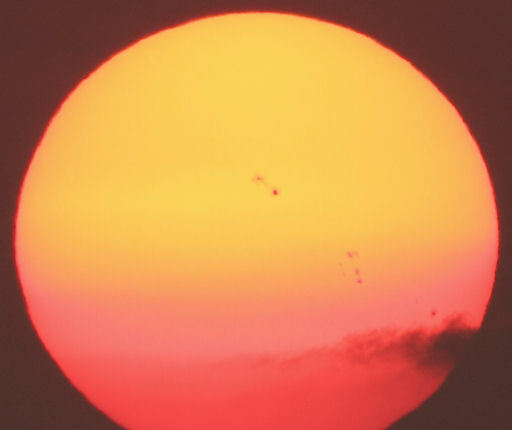 "The size and broiling movement of these sunspots just boggles the mind," he says. "You could fit every planet in the solar system with all of the known asteroids neatly inside the largest group...wow!" Caution: Even when the sun is dimmed by low-hanging clouds or haze, focused sunlight can still damage your eyes. Do not look at the sun through unfiltered optics of any kind. A safely-filtered White Light Solar Observing System is the best way to monitor these great sunspots. On August 4, 2011 there were 1241 potentially hazardous asteroids.